André Soulier is a highly experienced and nationally recognized trial lawyer. His litigation practice involves a broad range of business, criminal and civil matters and he is experienced in all phases of litigation work. 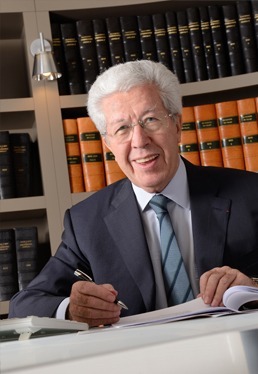 André has extensive expertise in personal injury and liability cases, especially with respect to the financial compensation of victims, since he has participated in numerous high-visibility trials relating to major cases in France over the past forty years. André’s areas of practice include criminal cases, white collar crimes, industrial risks and accidents, public law, real estate, insolvency & bankruptcy, business law and sports law. As a passionate litigator, he was notably at the origin of the 1970 French Indemnification Act which provides for the indemnification of people wrongly sentenced to jail and then cleared of all charges pursuant to a dismissal, discharge or acquittal ruling. André advises and defends French and foreign companies operating in wide range of industries, such as the traditional industrial sector, the finance industry and the so-called “new economy” sector. André is also a well-known public figure in France and Europe. He served as a Member of the European Parliament from 1992 to 1999 and participated in many diplomatic missions in Europe and in the rest of the world. André has acted as a deputy mayor of Lyon for more than 20 years and organized a large number of artistic, cultural and sporting events which helped the city extend its influence all over France and Europe. He was notably behind the G7 Summit in 1996 and the United Nations Framework Convention on Climate Change (UNFCCC). The Belvedere case: Belvedere's forum shopping strategy dismissed by the court of appeals of Nimes!